Here’s a sampling of some of our recent victories. You can read more about our long history of accomplishments here. Stopping the Overuse of Antibiotics: Our campaign to protect antibiotics has had unprecedented recent success. Thanks to our work and the work of our coalition partners, we helped convinced McDonald’s, Subway, and KFC to stop serving meat raised on routine antibiotics. Because the overuse of antibiotics on factory farms is creating antibiotic-resistant superbugs, this is an incredible step forward for public health. 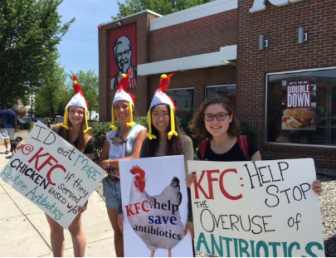 We collected thousands of photo-petitions, made hundreds of phone calls to corporate headquarters, and got dozens of media hits to convince some of the biggest fast food chains in the country to take action to save our antibiotic medicines. 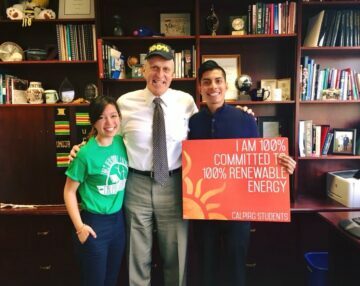 Getting to 100% Renewable Energy: We have had a number of victories on our campaign to transition to 100% renewable energy. 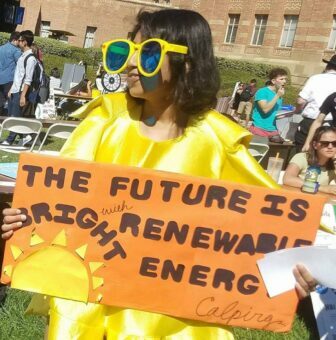 In California, we blocked utility efforts to gut the state’s strong solar energy incentives, successfully pushed the University of California system to commit to 100% renewable electricity by 2025, and helped pass a state commitment to 100% renewable energy by 2045. In Oregon, we helped pass the Coal to Clean bill which will double Oregon’s clean energy usage and get the entire state off all coal by 2030. And in Massachusetts, we passed city council resolutions in Salem and Dartmouth to move towards 100% renewable energy, and successfully lobbied our State Representatives to raise the cap on solar which will provide enough new clean energy to power over 100,000 homes in across the state. 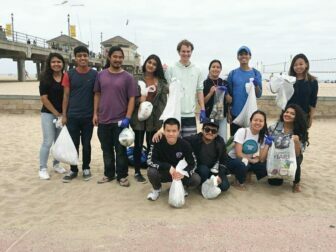 Banning Plastic Grocery Bags: CALPIRG collected over fifty thousand public comments from students across the state to ban bags and reduce ocean pollution. First, we helped ban bags in Los Angeles, the Bay Area, Santa Cruz, Davis and Santa Barbara adding up to over 110 cities and counties who have passed similar ordinances. Then, in August of 2014, the CA legislature voted to ban bags statewide. Finally, in fall 2016, CALPIRG Students collected thousands of petitions, held nearly a dozen press conferences, and helped pass Prop 67 which finalized California’s plastic grocery bag ban – the first statewide ban of its kind in the country. 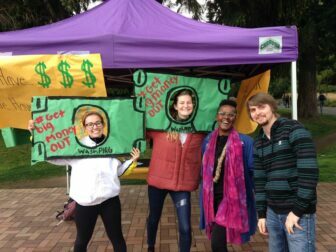 Democracy for the People: In Seattle, WashPIRG Students helped gather signatures to qualify the Honest Elections Initiative for the ballot, then helped canvass and phonebank to pass the initiative in November. In Connecticut, ConnPIRG students helped stop a proposal to gut the state’s public financing program. And recently, more than 100 PIRG chapter students joined thousands of other activists in Washington, D.C. for Democracy Awakening, a 3-day event including workshops, a rally, and a lobby day. 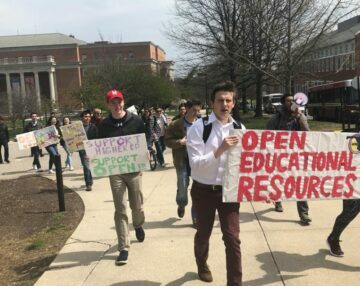 In addition to organizing their own transportation and logistics to get to the nation’s capital, students played important roles throughout the weekend, helping emcee the rally and helping lead meetings with legislators and their staff. New Voters Project: It’s time to make politicians pay attention to us. The best way to get them to pay attention to young people and the issues we care about is to show up to the polls, so this year we ran a nationwide voter registration and get out the vote effort. 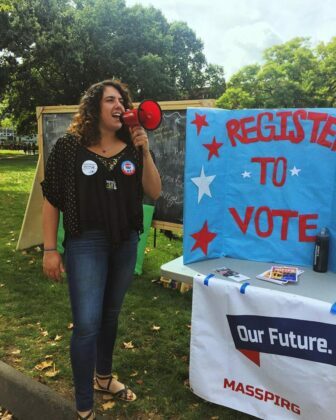 The Student PIRGs’ New Voters Project is one of the largest on-the-ground, non-partisan, youth voter mobilization campaigns in the country. Over the past 30 years, we have helped to register more than 2 million young people, made millions of get-out-the-vote reminders, and have increased youth voter participation in districts across the country. 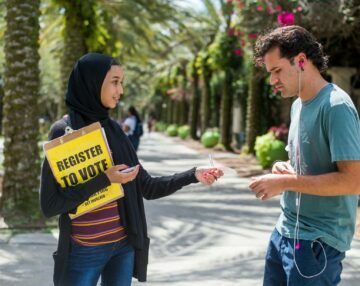 In 2018, our campaign reached more than 50 campuses in 11 states, helping over 30,000 students register to vote, and making more than 1 million voter contacts in the days leading up to the election. Our work paid off: Turnout amongst young people increased compared the 2014 election. In some student heavy precincts where we worked, youth voter turnout increased compared to 2016! 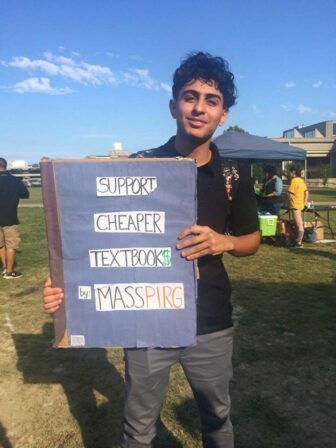 Making Textbooks More Affordable: Everyone knows that textbooks costs are out of control—than average student spends $900 per year! We’re promoting cost-saving solutions on campus while also tackling publishers’ stranglehold on the market to change prices for good. We’re educating students, faculty and bookstores and raising awareness through research and media attention. We’ve built a network of over 700 faculty members who support the use of Open Educational Resources (OER) low cost options, and we have helped start pilot programs to incentivize open textbooks at schools like UMass Amherst, UConn Storrs, and Rutgers New Brunswick, which have already saved students millions of dollars. Our work to build nationwide support for Open Textbooks culminated in the 2018 and 2019 federal budgets, with Congress approving a $5 million program each year to support Open Textbooks.